3D Particle View A new model add-on called MOSAIC-mix solves for particle size, the amount of the black carbon in the particle, and the ability of the particle to draw moisture, or hygroscopicity. 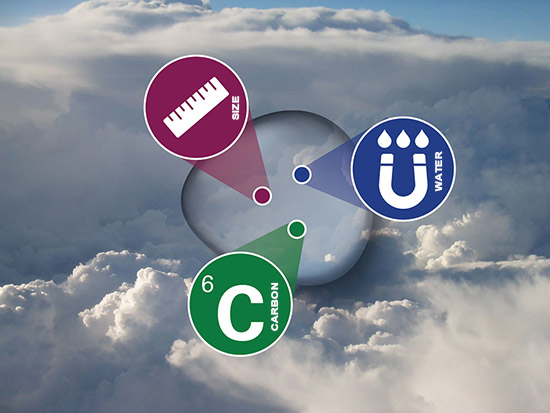 All three attributes are needed to accurately estimate how light reflective or absorbing particles are and whether they will form cloud droplets. MOSAIC-mix is suitable for regional and global models. Enlarge Image. Why use two views when three better describe the target? In this case, the target is tiny atmospheric particles called aerosols. They scatter and absorb sunlight radiation and provide the foundation or "seeds" for cloud droplets—wet or frozen. Researchers use simulations to study how they evolve and perturb the atmosphere, leading to new insights on how their complex properities influence the climate. Results: A research team led by scientists at Pacific Northwest National Laboratory developed a novel three-dimensional particle representation for aerosol modeling. This new add-on solves for particle size, the amount of the black carbon in the particle, and the ability of the particle to draw moisture, or hygroscopicity. 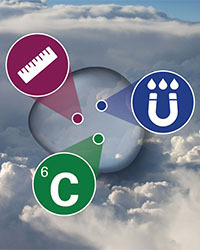 All three attributes are needed to accurately estimate how light reflective or absorbing particles are and whether they will form cloud droplets. The novel approach, called MOSAIC-mix, improves model predictions of how the particles handle sunlight energy and which will become cloud seeds. Equally important to modelers is that MOSAIC-mix is computationally efficient which makes it highly suitable for use in regional and global models. "Models need to represent the aerosol particle's ‘three-dimensionality' to get their climate-relevant properties right," said Dr. Joseph Ching, lead author and atmospheric modeler at PNNL. "We found that the novel MOSAIC-mix we've developed is well-suited for the job." Why It Matters: One of the largest puzzles in climate projection comes down to aerosol particles' impacts on climate. Getting a precise description only improves the understanding of their impact. Previous simulations solved for two attributes, the amount of carbon, and the size (which assumed that aerosols are internally mixed-one particle is just like another particle). This assumption potentially delivers large errors in results for the particles that actually form droplets. It also muddles information about their subsequent ability to block or allow sunlight through to the surface, otherwise known as their optical properties. More accurate predictions of these aerosol properties reduce the uncertainties in aerosol-climate interactions. Researchers developed this particle representation keeping in mind how computationally efficient it must be. This makes MOSAIC-mix ultimately suitable for regional and global models, which can't afford the more detailed computations of explicit (closest to nature) representations. Methods: Researchers at PNNL and their colleague from the University of Illinois-Urbana Champaign developed the high-resolution MOSAIC-mix to represent aerosol in a 3D sectional structure. The precise "mix" is 24 size sections, 35 black carbon mass fraction sections, and 30 hygroscopicity sections. They compared two model aerosol evolution simulations in 10 different urban environmental scenarios: the high-resolution MOSAIC-mix and a more explicit particle-resolved model. The two showed good agreement with each other. Next, they compared about 20,000 low-resolution and hence more computational-efficient MOSAIC-mix simulations having different 3D section boundaries to the high-resolution MOSAIC-mix based on error metrics involving cloud condensation nuclei (their aptitude at forming cloud droplets, or CCN) and optical properties. They found that the optimum low-resolution MOSAIC-mix sectional representation with a minimum overall CCN and optical error could be achieved with 24 size sections, 2 black carbon mass fraction sections, and 2 hyrgroscopitiy sections. What's Next? MOSAIC-mix will be implemented in a regional climate model to evaluate its performance using data from field campaign measurements. In addition, when implemented in regional and global models, MOSAIC-mix can help examine the impacts of aerosol mixing state on complex aerosol-cloud-climate interactions. Sponsor: This research was supported by the Department of Energy's (DOE) Office of Science, Office of Biological and Environmental Research (BER) for the Atmospheric System Research (ASR) Program. In one sentence: PNNL developed a novel three-dimensional particle representation for aerosol modeling to accurately estimate how light reflective or absorbing particles are and whether they will form cloud droplets.